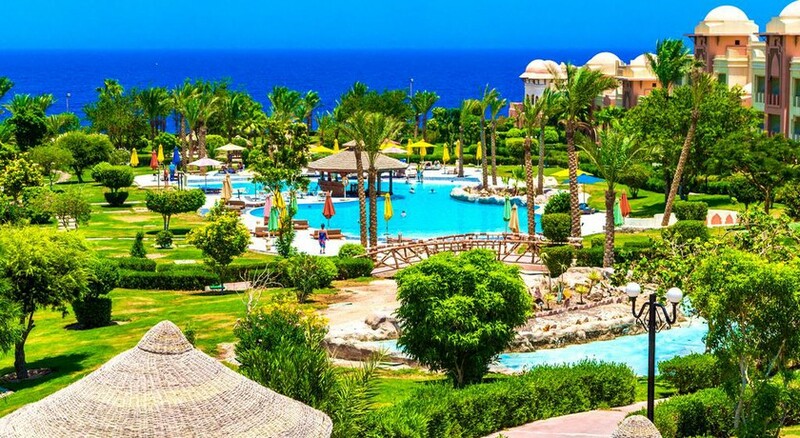 The Serenity Makadi Beach is a luxury 5-star beachfront hotel, located in Hurghada, Egypt. Located on the Makadi Bay, the hotel has its own private beach, which is right outside the hotel. The hotel houses 5 beautiful swimming pools on its premises. The architecture and interiors of the resort have been heavily inspired by the rich heritage of Morocco. The hotel houses 551 tastefully designed guestrooms which are equipped with amenities and facilities that ensure a luxurious and lavish stay the guests deserve. The hotel is located 40km away from the Hurghada, offering the guests an excellent opportunity to experience the life in Egypt closely. The property also houses multiple restaurants, lounge bars, pool bars and bars on its premises. 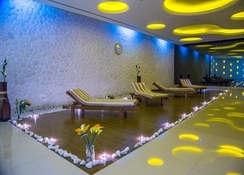 The property also has an exclusive upmarket spa. 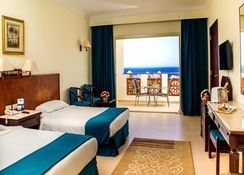 The Serenity Makadi Beach is located 33.3km away from the Hurghada International Airport. The nearest beach is 50m away from the property. 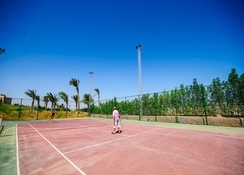 The town of Hurghada is located at a distance of 40km from the hotel. Cairo, the capital city of Egypt, is about 496km from the hotel. Tourist attractions and major landmarks like Makadi Bay Water World, Mini Egypt Park, Jungle Aqua Park, Senzo Mall and Sand City Hurghada are located within a range of 17km. The Serenity Makadi Beach has 551 tastefully decorated guest rooms which have been designed with utmost details, incorporating architectural themes inspired by the Egyptian and Moroccan motifs. The rooms are categorised into 4 types based on various aspects and amenities. Standard room garden view, Deluxe room sea view, Family room pool view and Executive suite sea view are the accommodation options available. The rooms are equipped with central air-conditioning, LCD TV with satellite channels, safe deposit box, tea and coffeemaker, minibar, mineral water bottles, iron and ironing board, balcony, shower, bathroom, bath linens, bed linens, essential toiletries, etc. The rooms offer either sea view, pool view or garden view. The Serenity Makadi Beach features 9 restaurants and bars that serve a wide range of international and local Egyptian cuisines. Apart from that, the bars also serve a variety of local wines, beers, signature cocktails, alcoholic and non-alcoholic beverages. The hotel houses Monalisa Restaurant, Rossini Restaurant, Royal Lounge, Marbella - Pool Bar, 2 Relax Pool Bars, Beach Bar, Lobby Bar, Bedouin Cafe and Discotheque. The guests can also try local restaurants and bars at Hurghada. The Serenity Makadi Beach houses 5 swimming pools, both fresh water and salt water for adults and children. This serves as a great option for recreational acivities. There are evening entertainment performances organised regularly by the in-house animation team at the resort where the guests can enjoy to their fullest. 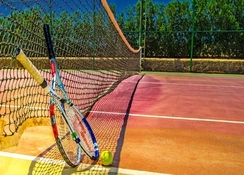 The hotel has facilities for sporting activities like diving, snorkelling, tennis, etc. 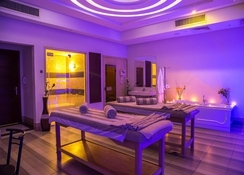 The hotel also houses a fully-equipped gym and a high-end spa and wellness centre which offers a range of popular massage therapies. The private natural coral beach across the hotel is also a great spot for the guests to relax and spend some quality time sunbathing or enjoy some beach sports. Lovely food and the chefs always around making sure you are enjoying everything and have all you want. My husband and I went for the first time to Egypt, this was an amazing experience. The hotel what far more than we expected and the food and cuisine was just spectacular. The staff were amazing and very professional. Swimming pools were just lush, had a great time. Great hotel and deff great service. Food catering for all. This hotel is being turned around by its present manager. Spotlessly clean, friendly and efficient staff. Very good value for money. We didn’t leave the premises as my 4year old grandson was extremely happy plsyng in the various pools, wave machine pool and the flumes. Great place, lives up to its name. A beautiful ambiance, perfect for families and couples. We enjoyed our stay the hotel itself was very good upgrading & updating was in progress. The mangement were excellent thoughly recommend the al a carte restaurants which served top quality food. Our only disappointment was the beach area we like to take walks along the shore which was impossible as you were blocked in either side of the hotel. We had a good holiday but wouldnt go back to this particular area, which let the hotel down . Not quite a 4 star hotel as the rooms need updating and the food isn’t all the good. However the staff and entertainment were amazing. Stayed at Serenity for 12 nights, a few teething problems the first couple of days probably because it was Ramadam. The hotel manager Aladdin was straight on to every problem and they were swiftly sorted. Pretty hotel, very clean and very good quality food. Staff are ultra friendly and always ready to be of service. Would definately go back. Only one drawback, which is nothing really to do with the hotel. The hotel is a bit in the middle of nowhere so if you want to go out to a bar or restaurant its taxi's everywhere, although they are fairly cheap. Beautiful gardens and lovely pools, but bedrooms need updating. The mattress was uneven. Stain on towel. The food had no variety and was tasteless. Too many flies around the food and not enough done to keep them away from the food.